Sh. 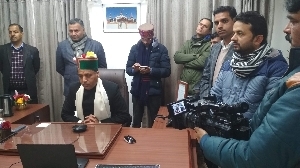 Jai Ram Thakur, Hon’ble Chief Minister, Himachal Pradesh interacted with 10 Cabinet Ministers of Himachal Pradesh on 6th January 2019 from Shimla, using NIC VC facility, during the Jan Manch program, which is held at Panchayat level, every first Sunday of the month, and is presided over by a Cabinet Minister. Public in large numbers come to these Jan Manch programs to have their grievances redressed on the spot. Hon’ble Chief Minister interacted with the Cabinet Ministers and also listened to the grievances and demands of general public who were present in these 10 locations. He informed that the Hon’ble Prime Minister has appreciated the Jan Manch program during his visit to the State on 22nd December 2018 and the program’s real objective is to provide Government services at the doorsteps of citizens and redress their long pending grievances in an effective manner. 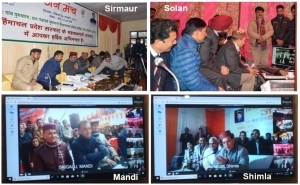 Other activities during the Jan Manch include, demands of public, cleanliness drives, inspection of public works, health camps, interaction with district level officers, issuance of various certificates, assistance in filling up of application forms of welfare schemes, distribution of gas connections etc. The NIC VC was conducted from the residence of the Hon’ble Chief Minister and DIOs/ADIOs of NIC provided the assistance at field level in various Panchayats. The reporting of Jan Manch is done through a software developed by NIC for this purpose.